Diablo III is so in right now. After the unsurprising announcement about Blizzard Entertainment's latest game, we pinned down man of the moment, lead designer Jay Wilson, down for a chat about the latest installment in the Diablo franchise. Jay Wilson: In the previous two games, Diablo and his two brothers, Mephisto and Baal, were the three Prime Evils of a world called Sanctuary. Where we start off in Diablo III, it's twenty years later (after Diablo II: Lord of Destruction) and the brothers are gone, they've been vanquished. Essentially everyone was kind of geared for Hell to actually invade. At the end of Lord of Destruction, the Worldstone was destroyed, it left a giant crater and everyone was expecting the hordes to come pouring out of it and nothing happened. So, Deckard Cain is one of our main characters from the first two games, he's spent the last two decades trying to find out where the last two Evils are, what they're doing and why the invasion didn't happen. A lot of the rest of the story focuses on Tyrael, the Angel of Justice, and what's happened to him since that event as he was actually the angel who destroyed the world. Kotaku: From a lore point of view, the mythology of Diablo seems just as complex as it is for Warcraft or Starcraft, do you think this is important? Jay Wilson: Yes, absolutely, it's one of our main focuses of the game. What was funny was that when I gave you the synopsis of the game, it feels so simple! We love the story. Kotaku: You said earlier that you'd been working on the game for what, four years? Do you think that taking longer over a game improves the final product significantly? Jay Wilson: Four …. or five, somewhere in that area. I think taking as long as a game needs to take guarantees that it's a good game. It's hard to say whether it improves the end product but sometimes it's necessary. Blizzard only releases great games so if it's not great we just don't release it. One of the things I would want to say, especially to our most patient fans – the ones that have been hoping for Diablo III - is that I hope they see it's a testament of our love for the franchise that we wouldn't release it before it's good and ready. We've really spent this time trying to make a sequel that was worthy of them. Kotaku: In the demo you showed during the Opening Ceremony, you gave us a glimpse at the Witch Doctor class which seems to use several spells similar to those found in World of Warcraft. Do you worry that some fans will think you're just copying aspects of WoW? Jay Wilson: No. Do I think people will say that? Yes, I think they will. One of the things I like to remind people is that it's okay to steal from ourselves. A good idea is a good idea and a good skill is a good skill and so when we look across all our games we borrow from each other all of the time. But the really key and important thing is do we play like World of Warcraft? No! We don't play anything like it, Diablo has a different feel to it and that's fine. If we look at the history of Blizzard games, at Warcraft I and II, the spell Blizzard appeared, it also appeared in WoW and Diablo II. I almost think it's more like a signature but as long as a game has enough original stuff that it stands on its own and plays like its own game, that's what matters. Kotaku: In that case do you think that this might work in your favour, that WoW players, for example might be persuaded to try Diablo III? Jay Wilson: Yeah, actually, I do think that. I think players like things that they are familiar with and I don't think there's anything wrong with them saying: "Oh, this class is like the warrior in WoW. Cool, I wanna play that!" Especially if it's going to get them into the game. I think we gain as much as we could lose, people love to see something familiar and the reaction to Whirlwind was a great example. Kotaku: You only joined Blizzard recently, does your passion for Diablo stretch back further than that? Jay Wilson: Yes, I am a Blizzard fan. My first Blizzard game was Rock N' Roll Racing so yeah. Warcraft I, II, StarCraft - I'm a huge StarCraft fan, Diablo I and II; Diablo used to be spoken of in hushed tones in my house because I was so excited and I pretty much played Diablo II since the day it came out. It's one of those games that's great to go back to. Kotaku: Why do you think Diablo has captured so much attention? Jay Wilson: I think you could pick out a lot of things: the setting's darker and people like that, especially now. I actually think Diablo II wins on the fun scale. All of the Diablo games, they're fun to play and that's important. You could take the most flawed game in the world and as long as it's fun it's okay. Diablo II's super easy to play, you could teach your grandmother to play it in five seconds. Kotaku: With the popularity of WoW and other online games, Battle.net seems to have nearly disappeared into the background. 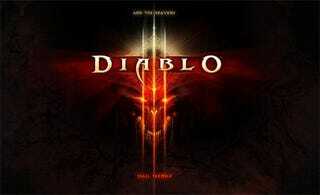 Do you think Diablo III will breathe new life into the service? Jay Wilson: I can't really talk about Battle.net but I will say, Battle.net will not be a background. I'll be huge, the next version will be absolutely Blizzard's focus. Everyone is going to be thrilled when they see the kind of stuff we have planned! It feeds into our overall focus of providing a really great service for our players.